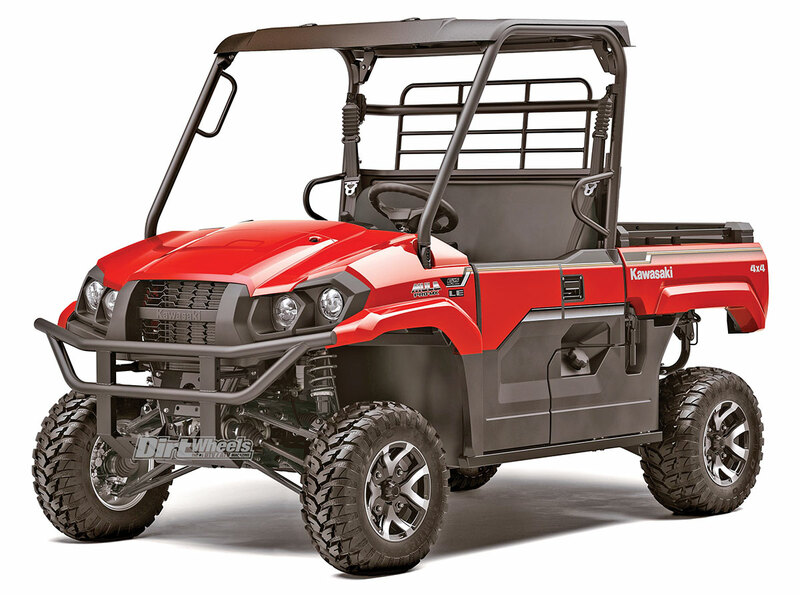 The all-new Kawasaki Mule Pro-MX is a smaller version of their existing Mule lineup. They consider it to be midsize all around. — Could you win the pro motocross class in this? 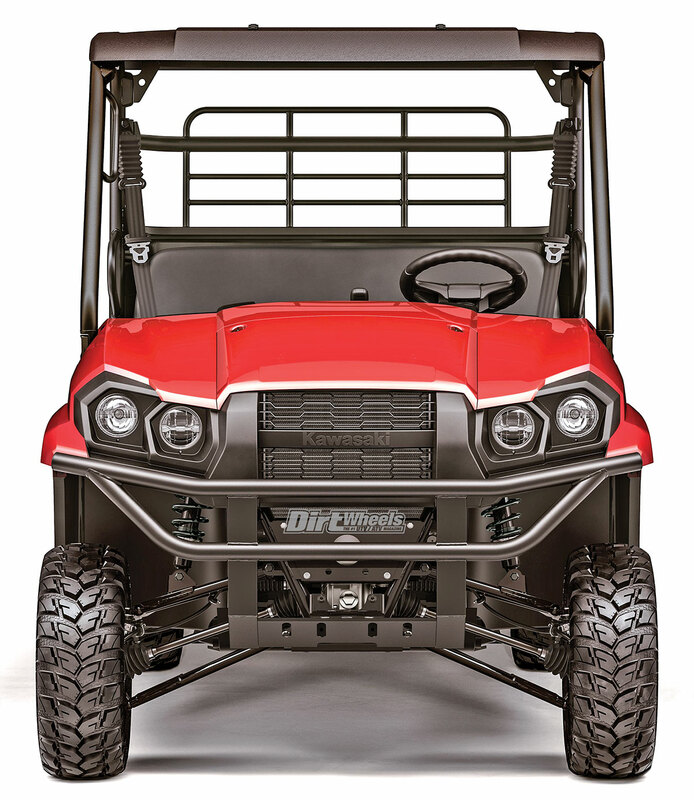 Kawasaki releases yet another all-new UTV! Is it a sport machine, capable of flying high and racing over 70 mph? Nope. Will it make your life more fun and work around the property much easier? You bet it will! The Mule Pro-MX is a preshrunk version of Kawasaki’s relatively new Pro-FXR. The FXR is a shrunk-down version of the Mule Pro-FX. Do you see the theme? Sometimes, smaller is better. 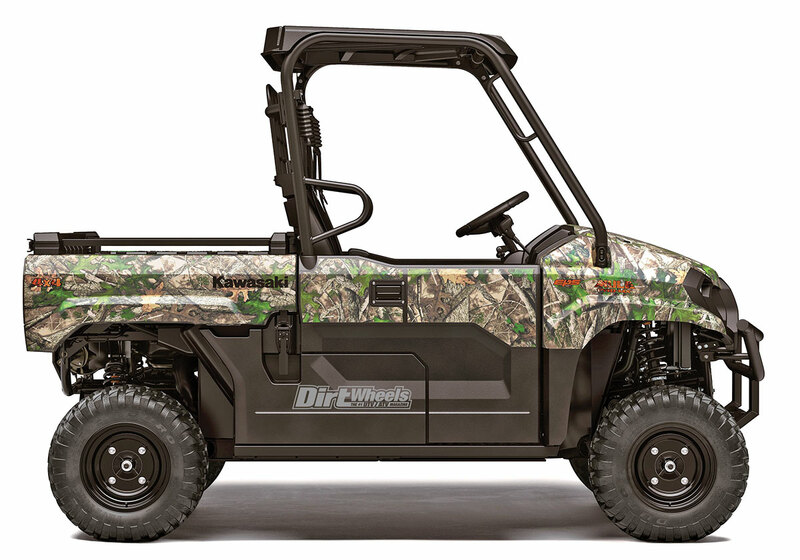 One of the three versions of the EPS-equipped Mule is a camo model, which is ideal for hunting. We don’t get our hands on this new machine for a bit, so we will just have to lay down the facts for now. The Mule Pro-MX is more compact in comparison to its family members. Instead of a 64-inch width, the MX is only 60 inches wide. The wheelbase is shorter by less than an inch over the already-compact FXR at 78.9 inches. That can only mean the turning radius will be even better, and we were already impressed with the FXR’s capability. The MX also operates as a two-seater instead of three or more. Kawasaki calls this their midsize model. There are three versions available so far, and they all come with electronic power steering. The Mule Pro-MX EPS is offered in Timberline Green and Bright White for a starting price of $11,999. The Camo version of the machine has the same features for $12,649. And last, the $12,499 Pro-MX LE in Firecracker Red gets some nice aluminum wheels and a roof. The wheelbase is 78.9 inches on the Pro-MX, which means it should have a great turning radius. The engine of the new Pro-MX is smaller than its siblings. Kawasaki stuffed a 695cc single-cylinder four-stroke engine in the frame. 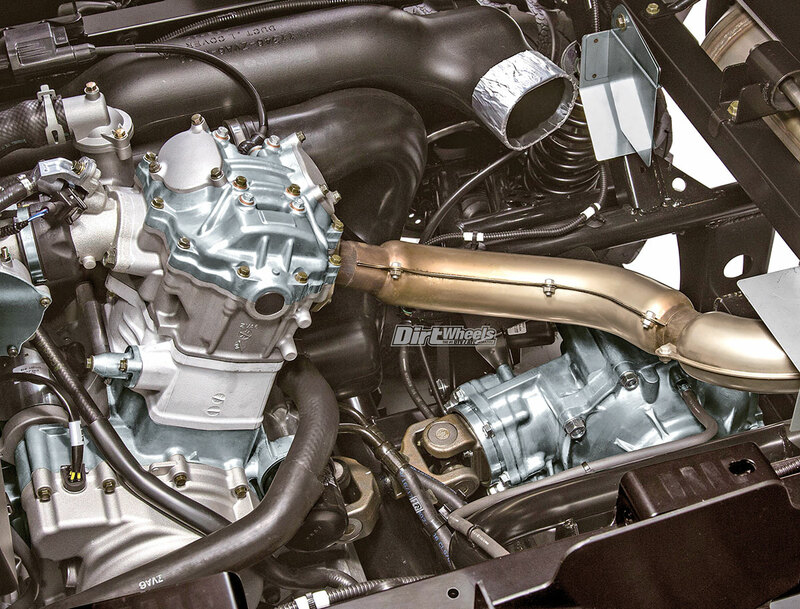 The motor is liquid-cooled, electronically fuel-injected and is a single-overhead-cam style. That is quite different compared to the other Mules’s triple-cylinder four-stroke powerplants. The MX comes with engine braking. The Pro-MX has a 695cc, single-cylinder four-stroke engine that is electronically fuel-injected. The transmission is a fully automatic CV style with a high and low forward gear, neutral and reverse. The Kawasaki’s wheels are shaft-driven through a rear locking differential and a non-locking front diff. It is safe to say that the Pro-MX will leave a soft footprint on grass if you unlock the rear diff. The interior layout looks somewhat similar to the Mule’s bigger siblings. There are multiple cargo containers on this machine. 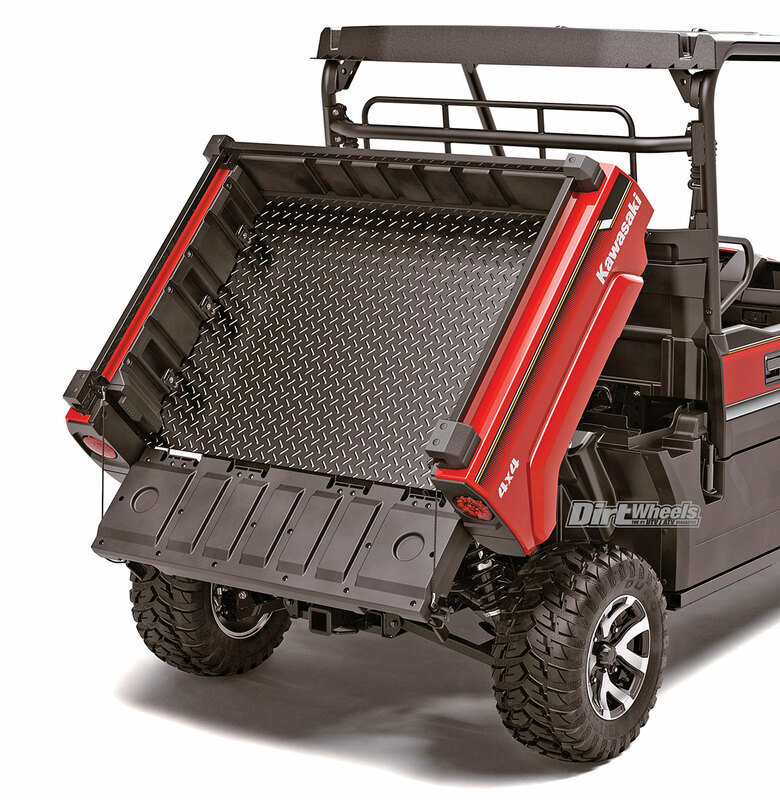 The Mule can tow up to 1500 pounds through a 2-inch rear hitch receiver, and it has a tilting cargo bed. 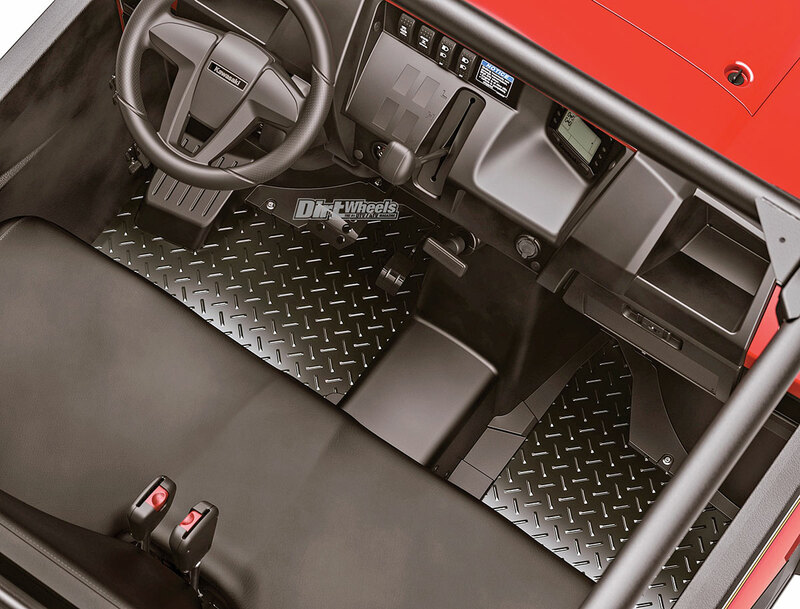 There is a 700-pound max weight limit for the bed, and gas-charged shocks help you tilt it. Kawasaki builds durable machines that are fairly easy to work on, and we feel this machine is no different. We don’t have all the info we need on this new machine yet, but we do know that the suspension is independent. The machine uses a dual-A-arm design in the front and rear with coil-over shocks. 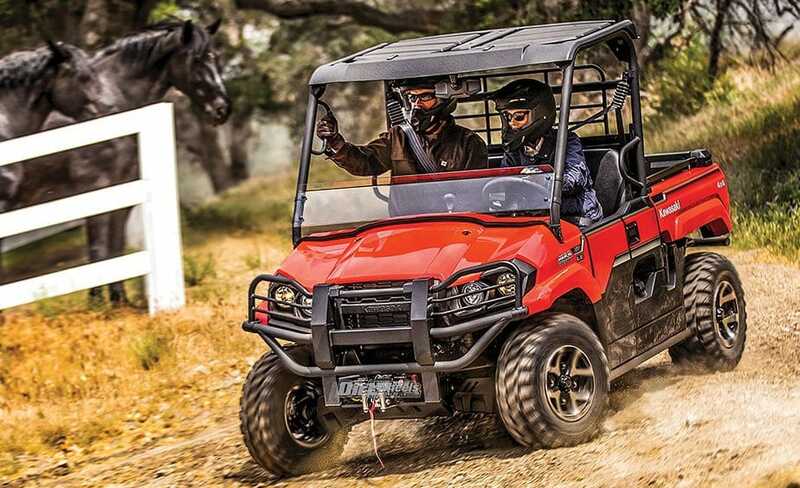 Turning the Mule should be easy since all models of the Pro-MX come with EPS as a standard feature. The EPS is speed sensitive, so it softens its output at higher speeds. The Kawasaki comes with a tilt-able cargo bed with tie-down points. The bed can hold up to 700 pounds. The cockpit is smaller than the rest of the Mule Pro line, but it still looks spacious. There is a 2.4-gallon storage setup under the hood with a 1.4-gallon storage container under the passenger seat. A lockable glove box rests in the dash, and there are other storage pockets, trays and drink holders in the cockpit. Kawasaki designed the Mule with independent front and rear suspension. So far, this seems like a great work machine that is very oriented in the recreational market as well. 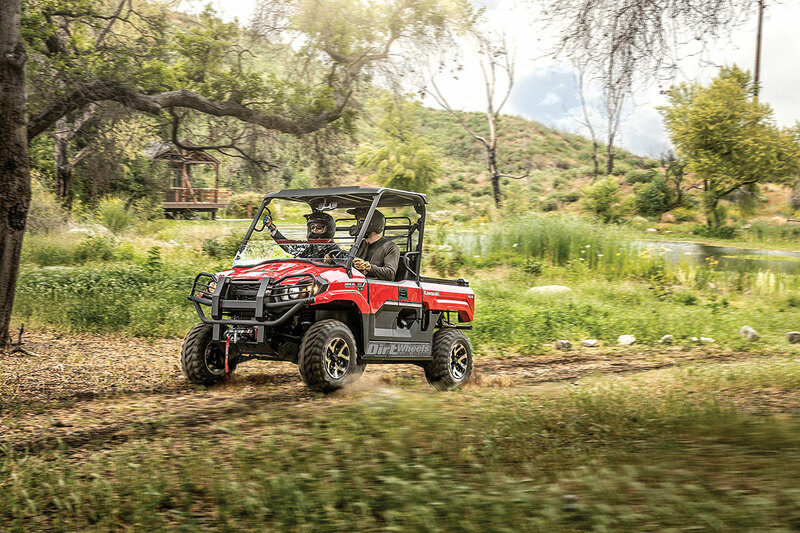 Once you are done working for the day, you can take this machine out on tight trails to go hunting or simply for a fun ride. 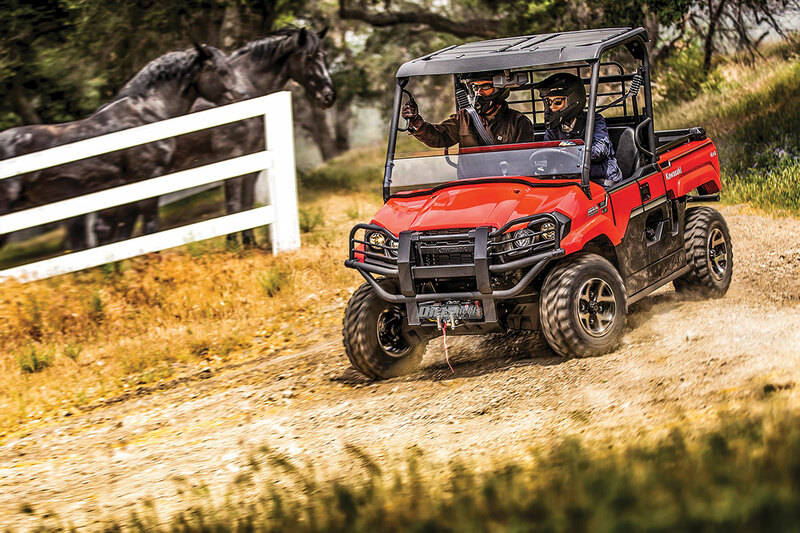 Stay tuned for a full test on Kawasaki’s all-new Mule Pro-MX in a future issue! Go to www.kawasaki.com to get more info on their full lineups of ATVs and UTVs.